A Bowen Island family says the West Vancouver School District is failing to protect their 14-year-old son from bullying by refusing to provide supervision for his daily ferry rides to and from school. 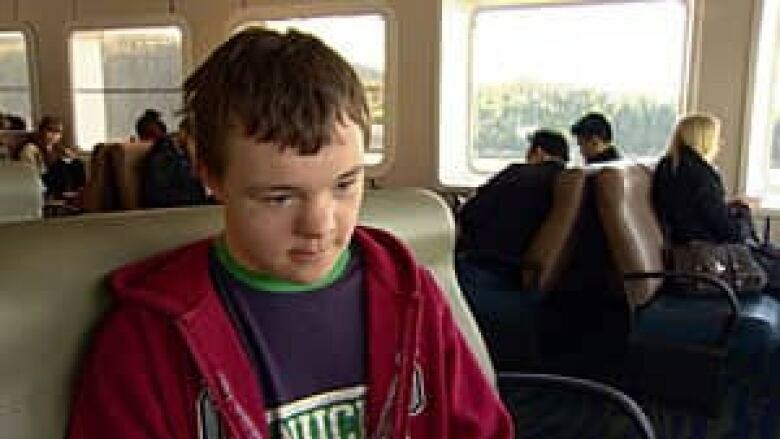 Daniel McGregor, of Bowen Island, has Down syndrome and, like all high school students on the island, he must take a ferry to the mainland and then catch a school bus in West Vancouver. When McGregor began the daily commute, he had a Special Education Assistant (SEA) to accompany him on the ferry rides, just as two other Bowen Island children with Down syndrome had prior to 2011. But the service ended for Daniel last fall when the school district said he was ready to be more independent. "We're all for independence," Daniel's father, Doug McGregor said. "However, there's been no planning, no collaboration with the parents, as to how we can make Daniel independent in a safe manner." Daniel's parents say since the supervision ended he has been bullied and taunted on the ferry ride to school. Over several months, they learned of several instances from witnesses and other students. "One of the kids took his bag and wouldn't give it back to him. There was another incident where they were playing hide-and-go-seek with him and they let him go hide and they left him. There's another incident where they said 'come and sit with us' and when he came over and sat with them, they ran away," Daniel's father said. Daniel's mother says her son has trouble deciphering when kids are laughing with him, or at him, and just wants to fit in. He often will do anything the other kids tell him to. "He just completely believes that he is being accepted and they are being friendly. He believes that, and that breaks my heart because he is just left in this situation every day on this ferry and these things happen to him," she said. One time, as students were getting off the ferry, a child went ahead of Daniel and locked him out of the school bus. Daniel was found alone, crying. His mother says that sometimes when he becomes stressed by the teasing and bullying he ends up scratching himself, out of nervousness, or picks at scabs until he bleeds. She says that the school district is not allowing him to get to school in safety. "They are failing to keep him safe, yes they are, by leaving him on his own every day to travel on the only method to get to school which is the ferry," she said. "Yes, they are failing him." Daniel says he is now frozen with fear when he is alone on his trip to school. "When I go to school on the ferry... I can feel something down my body, like ice," he told CBC News. Daniel's parents say he is generally happy and sociable but, starting last June, he became the target of bullies at his elementary school on the island. Do you have a story we should investigate? Daniel's mother Karen says her son was swarmed, humiliated and videotaped as other children had him put a hockey stick in his mouth. She was horrified when she saw the video, which was posted and shared on Facebook. "They were screaming and laughing at him to put the end of a hockey stick in his mouth and to keep putting the hockey stick in his mouth whilst another student filmed," she said. At that point, the McGregors and the school district decided it would be better for Daniel to move on to West Vancouver Secondary. But now, without an assistant with him on the ferry trip, Daniel has become the target of bullies once more. Chris Kennedy, superintendent of schools for the West Vancouver School District, disagrees with Daniel's parents description of what is going on. "We've worked with the [McGregor] family and haven't always come to an agreement on exactly what they'd like and what we're able to provide," Kennedy said. Though the district is aware of "a couple" of incidents on the ferry ride, Kennedy said he hasn't been made aware of any ongoing pattern of bullying and, instead, Daniel is actually becoming increasingly independent. "He's actually thriving and being very successful in terms of that transition," Kennedy said. Kennedy said he wasn't aware of the numerous incidents of bullying happening on the ferry that the McGregors relayed to CBC News. "That statement doesn't match up with anything that's come forward to us. When any kind of issue around misbehaviour on the ferry is brought forward, we work through those ones immediately. A couple have been brought forward, and we worked through those ones in the fall, but to suggest that there is ongoing bullying isn't accurate," he said. The West Vancouver School District provided CBC News with a written statement after this story first appeared online. "Parents and schools have a shared responsibility for getting a child to school safely, and the district has gone many steps beyond in order to assure Daniel makes the transition safely," the statement reads. "Meetings and discussion occur regularly between the families and the schools in special needs cases, and this has been true for the McGregors all along. In fact, they have refused meetings on more than one occasion, so it is grossly unfair for Mr. McGregor to claim there’s been 'no planning, no collaboration with the parents, as to how we can make Daniel independent in a safe manner.'" As for the previous cases where two other children with Down syndrome were supervised on the ferry and the bus, Kennedy says each case is treated differently. Under the B.C. School Act, school districts aren't obligated to provide supervision during transportation to school, or even transportation at all, but the province does have a policy that advises districts to "develop procedures related to transportation of students with special needs...The method of transportation may be by bus, water taxi, ferry, train, etc." The policy also says: "For students with special health or behavioural concerns, districts should consider assigning support staff to accompany and supervise these children..."
But B.C. 's Ministry of Education says the policies are only guidelines, and are not enforceable. The McGregors believe that although the school district doesn't have to provide an assistant for Daniel's commute, it should, in order to keep him out of danger — a danger the district recognizes at least on paper. The McGregors provided CBC News with a copy of the West Vancouver School District's latest psychoeducational assessment of Daniel, from June 2012, which says: "There are safety concerns around Daniel's level of mental ability. He requires ongoing supervision with a goal towards becoming as independent as is possible." And, the McGregors say, there are teaching assistants who live on Bowen Island and also have to take the ferry to the mainland anyway. Doug McGregor says he worries every day that something terrible will happen to Daniel on his way to or from school. "I'm anxious. I feel my son's unsafe. I feel he doesn't have the mental ability to deal with the situation with the students on his own. He needs that supervision. He needs that interaction with an adult who is experienced, so he can learn how to behave properly and in these situations," he said. The McGregors say they met with the superintendent two weeks ago and were told that the decision to end the supervision on the ferry was final, and they should move on. The McGregors say they are moving on, and are considering taking their case to the BC Human Rights Tribunal.